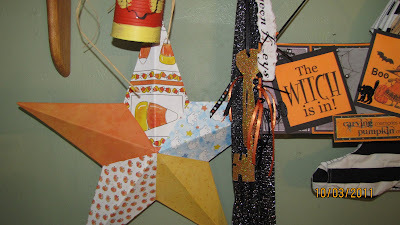 Spook some delight into your Halloween celebration and add a Witches Closet! 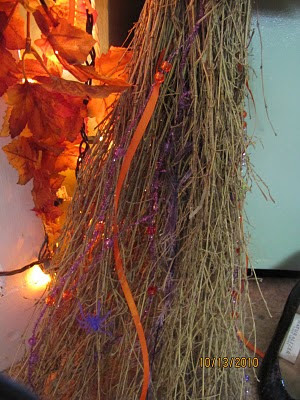 Our witch will be "boo-tiful" with her striped socks, glittery scarf, "gourd-eous" hat and flowy dress. 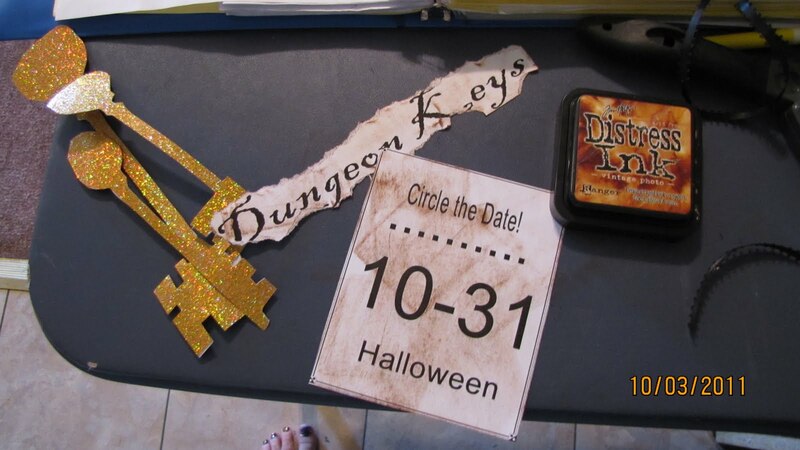 She even has "spook-tacular" shoes and keys to the dungeon. You can scare up a few tricks by having a witches closet too! 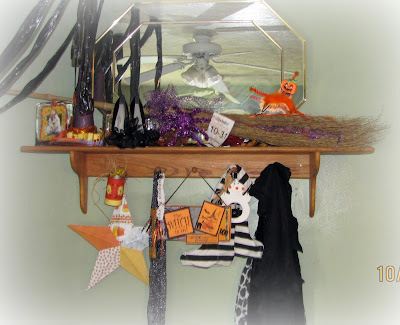 However you choose to do it, use your imagination to spread the magic as you make the perfect Witches Closet for your Halloween fun. I always seem to get bored of doing things the same way year after year and try to shake it up a bit. I took a bunch of stuff we already had, added a couple of new things and decided to make this Witches Closet. We have a "Witches Kitchen" so a "Witches Closet" just across the room seemed like a perfect addition. 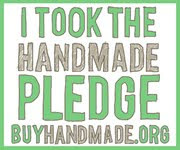 I have been on a quest the past couple of years to use up the supplies and other resources I already have and spend as little bit of money as possible. 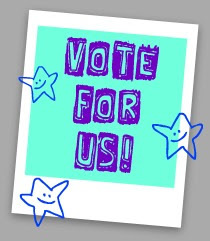 Top of the shelf has a hat, shoes, purple sparkley pet spider, and broom. These are some of my mom's shoes. My parents died just a few days apart and I really miss them around holidays so I try to incorporate something of theirs in all my holiday decorations. 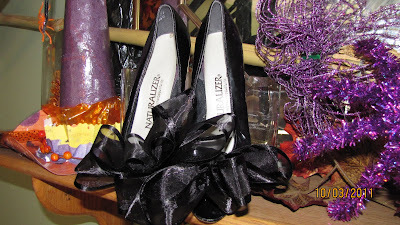 These shoes are the centerpiece of this display. 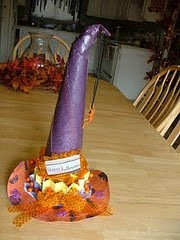 I made this hat a few years ago for a centerpiece. I have used it for several displays - works great in the Witches Closet. . Here is the tutorial for this hat. 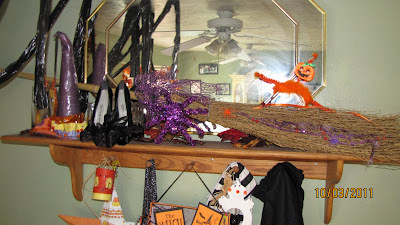 This is my witches broom that has bling! 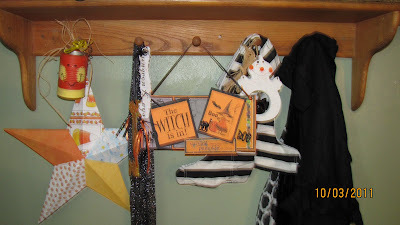 On the pegs are metal star, trick or treat bucket, sparkly scarf which any self respecting witch has to have, witches in sign, striped sox, cape and dress. I had an old metal star that wasn't being used and some scraps of Halloween scrap paper. I made a pattern of one of the points, cut 5 different patterns and glued it on. The keys I ran a pattern from the print artist program and glued it on the back of some sparkly paper left over from Christmas gifts last year. 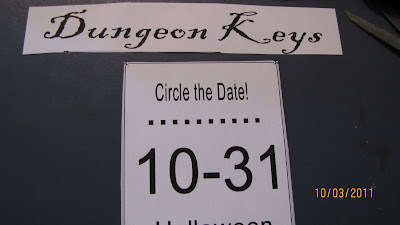 The dungeon sign ws made on print artist as was the date tab. 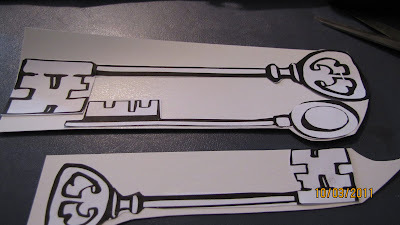 Then I tore the edge of the Dungeon Keys sign and used distressed ink on both. This sign a made a couple of years ago and thought this is the perfect spot for it. I used to hang in near the broom and a pair of shoes near the front door - it looks great in the closet here.